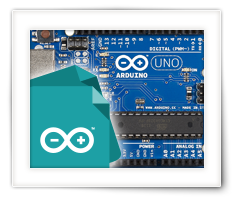 In this seventh installment of our articles on how to do Arduino Programming for beginners, we will take a look at working with text, or “strings”. So far we have worked with numbers and booleans, and touched on strings even though you might not have noticed it. In this article we will dig into strings, how they work and what we can do with them. This is the seventh part of a series of articles I’ve written to get beginners started with Arduino Programming in the programming language C, which I’ve written with the intend to teach my 13 year old nephew (Bram) to get started with the Arduino. After all, he wants to build a robot, but without some basic knowledge about programming, he won’t get far …. Besides an introduction into the language C, the default language used for Arduino Programming, “Arduino Programming for Beginners” will also touch topics like how to setup an Arduino, get a developers environment running, and look at a few basic electronic parts which we connect to our Arduino. A complete overview of this course can be found here: Course Overview. It’s all nice and dandy to work with booleans and numbers, but we also need to work with text to communicate. Granted, the Arduino doesn’t have much use for text when used on it’s own. It has no display. But a display can be attached, or text can be send/received through the serial port and other ways of communication. We have used strings already a few times. Each time when we used a “Serial.print() ” or “Serial.println() “, we actually already used strings. Remember that a text in C needs to be enclosed in double quotes? That would make it a string. But to work well with strings, we need to understand what a string really is. First of all, we can use a “string” (all lowercase!) – where a string is a so called array of characters. In English that makes sense: it’s a “list” of characters. The second way of working with strings is by using the “String” object (notice the capital “S”?). An “array” (Array Data Type, Array Data Structure) can be seen as a collection of elements of the same data type. See it, in it’s simplest form, as a list. In the case of a string: a list of char(acters). The variable that we define, actually points to the first item in the array – or better said: it points to the memory location of the first item. In the case of a string, the array keeps going, until your Arduino finds a NULL character. The NULL character terminates the string – or indicates the end of the string. Yep, a NULL, a nothing. There is a special character defined for this (see our character list). It’s character zero. But we do not (yet) have to worry about that – but it is something to keep in mind. Since strings are quite often used, the language “C” which we use for Arduino Programming, comes with a standard library of string related functions, which handle quite a lot already automatically. Another thing to keep in mind is that arrays start counting with “0” for item 1, “1” for item 2, etc. This is called zero indexed or zero based numbering – counting starts with zero. A string (Array of Characters), is terminated by a NULL character. Arrays are ZERO INDEXED, which means they start counting with zero. However, that doesn’t work … you’ll get an error message that “string” was not defined. What this does, is create an array of characters (which is a string), the empty square brackets basically says “compiler! Go figure out yourself how large this array should be“. If we would have entered a number, then that number should at least be big enough to hold our string plus one NULL character. In the example that would be 4 characters for our text and a fifth character for the NULL character. Note that if the number is bigger than the number of characters we need, then this will work just fine. However, your Arduino might allocate the extra characters as well and waste memory space as we’re not using it. On the other hand, if you expect the string to change in the program and all those characters might be needed, then you’d already be prepared. If this number would be too low, then your compiler will complain and show an error message. Leaving length the string array (char variablename = “…”) undefined will make that the compiler determines the required size of the array – one time only! Accessing an Element of an Array outside of the length of the array can cause unexpected results, error messages or even crashes of your application! The variable “Name” points to the memory location of the “H” character of the string, which is at position 0 (zero) and therefor has “0” as it’s index number. We can actually retrieve that character. For example “Name” would result in an “n”, “Name” would return a “H”, etc. If we send address the whole variable, “Name”, then it would return the address of “Name” but your program will keep pulling up the next index, and the next, and the next, until it reaches that NULL character. So in the end, it will return the text of the string. Now we can actually assign a different character to an element (or item) in an array. We now know about variables and strings, and we know how to define a string and assign it an initial value. What if we want to change the string, for example, replace in “Hans” in our string with “Bram”? The Arduino compiler will give you the error message “invalid array assignment”. But a string is a string right? Not really. Remember how I said before that the variable (in our example “Name”) actually points to the memory location of the first element in the array? It’s a memory address, which is not the same as a string. Believe me, this is something you’ll run into quite often, and it’s one of the reason why I’m not a fan of the C-language (I’m more of a Pascal fan – and plenty of people will argue with me on that one). Unfortunately this makes things more complicated, and we’d have to assign each character to the proper element. Thank goodness there is a function for that: strcpy() . This function, read it as “String Copy”, takes 2 parameters. The destination where the string should be copied to, and the source where the string is coming from. The destination should be a variable, it has to be able to “receive” the data, so it has to be the proper data type as well. The source can be a variable, a constant, or a string (tekst between double quotes). Now sometimes we’d like to print for example double quotes, but just typing them into a string will not work – the string would break. The compiler will think you’re done after seeing the second double quotes and everyting remaining will become an unclear mess. Other special characters are simply impossible to type without making things a mess as well! The code highlighting of the Arduino IDE text editor, will show you if a string “breaks” or not, by changing character colors in the string you just typed. To actually enter a double quote in a string, we need to use an escape character, which in the language C is the backslash (\). The first line shows us the wrong way of doing it. The keywords of importance are printed in orange en the string in a green-like color. But … our string has a chunk of black text in it. The word “guest” is black. It means that this is not part of the string, which is caused by the double quotes around the word “guest”. Now the second line shows the colors the way they should be, and for that we removed the double quotes. You see the entire string being green-ish? The third line shows us the trick with the backslash. We placed them right before the special character, so the compiler knows that the next character is special and part of the string. This trick has to be used for certain other characters as well, for example starting a new line is an ASCII character (see the character table, and look in the “Esc” column). If we’d like to place a line break (start a new line) in our string, then we would need ASCII character 10, which we write as “\n”. You do not need to memorize these, you’ll remember them after having used them a few time. We have mentioned that we could assign individual characters to the array elements of our string,… so how is that done then? We have seen that we use double quotes ( “ ) to enclose a sequence of characters. We can even make a string of zero characters (just: “”) or a string of one character (“A”). But these are all strings. Double quotes are used for strings, which can be zero or more characters. The error message invalid conversion from 'const char*' to 'char' tells us that we are assigning the wrong kind of datatype to our array element. In simple words: This is because we are trying to assign a string to a character. To make this work, we need to assign a character to the char, instead of a string and for that purpose we use single quotes ( ‘ ). A way to remember this: one quote = one character, multiple quotes = multiple characters. Single quotes are used for char(acters), which is exactly one character. Name = 'H'; // this works! Let’s look at the previous example, and expand it a little. We want to replace the name “Hans” with the name “Bram”. See how we have to assign each individual character to each individual array element? We can skip “Name” because it already holds the NULL character and we do not want to change that. Now “Name” and “Name” are both a NULL character, which is equal to zero. See how we assign a char a number, where we assign the number zero to Name? Instead of assigning it a character, we can actually use the ASCII code for a given character. See our character table for those numbers (look at the column “DEC”). Obviously, using ASCII is not the obvious way to do it when you’d like to assign text to a string. However, there are scenario’s where this can be very practical. I’ll illustrate this with a quick nonesense example, which quickly lists all the letters of the alphabet, where we can use a “for” loop to count from 65 (=A) to 90 (=Z). Now that we know that characters are done with single quotes, we could also do this with this kind of loop. Just keep in mind that a char can be “counted” as well, and this actually does work (see code below). Char is in essence a “byte”, and as we just have seen, we can assign it a number – so char can be counted as well, as if it’s a whole “number”. Note : don’t forget that we are counting chars – so we must use single quotes! In both examples the output will be the alphabet in uppercase characters. We have seen that function “strcpy()” (read that as “string Copy”). There are a few practical other functions we should mention. “strlen()” (read as: String Length) takes one parameter, a string, and returns the number of characters in the string. It will however not count the NULL character at the end. “sizeof()” does the same thing as “strlen()”, however it will include the NULL character in it’s count. It actually returns the size of the full array, even if it would be filled with NULL characters. “strcat()” is an odd one, it will add a string at the end of a given string variable. Read this one as “String Concatenate”. Let’s glue these 4 functions together in an example, so you get an idea. Name = Hans has two nephews, called Bram and Max! If we do not define the string length, the compiler will determine/guess the length one time only! Accessing elements beyond the size of the array can give unexpected results. What this does, is that the compiler will guess the required array space, one time only! This means that it will see the string “Hans” and will determine that these 4 characters will need an array of 5 characters (text plus NULL character). See the funny characters, and you might notice that your Arduino keeps spitting out funny and weird characters!? That’s because the array was only 5 characters long. Not exactly what we expected to happen right? And thats the reason why you have to pay attention to the length of an array. The previous “string” was an Array of Char. With a lowercase “s”. The Arduino IDE however, offers another “String” (capital “S”), which is an object. The tedious and cumbersome things we had to do with the old “string” (lowercase: Array of Char), are done much easier with the “String” (Capital “S”: an object) object … but what is an object? We haven’t learned much about objects yet, even though we have already used one (Serial). A very short explanation of what an “object” is, would be a “thing” or “item” with properties and functions (methods). Such a “thing” could be anything, for example a “car“. Let’s keep this simple and assume a car has a color, a working engine, possibly some gas, number of doors, a trunk, and wheels. These are called “properties“, they do not do anything, they’re just a given fact, items it already has (or could have). One of those “could have” properties could be “driver”. Since the car can be empty (driver == NULL), or a driver can sit in the drivers-seat (driver != NULL). Now a car can move (driving), park, honk it’s horn, open or close the trunk, open or close the doors, etc. These are functions of the object “car”. In “object oriented programming” we call those “methods“. Methods actually “do” something, actions you can do have the car do or that can be done with the car. There are several reason why we’d like to use objects. For one; everything is logically grouped together. There is no confusion to what item the properties or functions belong. So when we aks for properties or call a method (function) of a given object “car” then we know it only relates that that specific car. Another reason is that once an object has been defined, it actually kind-a behaves like a data type, which can use for variables. Say we have one “car” then we create a variable “MyCar” as the object (data type) “car”. But if we have a garage filled with cars, then we can re-use that same definition to create multiple variables (MyCar, YourCar, DadsCar, MomsCar), or even an array of cars (Cars, Cars, Cars,…). Now we won’t go into object right now, but it’s good to have a basic understanding what an object is. The “String” (with capital “S”) and “Serial” are such objects. With “Serial” we have already seen the methods (functions) “begin”, “print” and “println”. We call these methods to have the object do something , like start communication, or send a string to our Serial Monitor of our Arduino IDE. Maybe you’ve now seen that we always call an object in a format like this: OBJECT.METHOD or OBJECT.PROPERTY? We call the object and separate object and method (or property) with a period. As mentioned and shown before: the array of char variant of a string is a little cumbersome to work with. So the good people at Arduino created an object to make working with strings easier. Again a reminder: it’s the “String” with a capital “S”!!! You will see pretty quickly how much more powerful the “String” is compared to the “string”. As we have seen with the old “string”, we can simply create a variable and assign it a value in one single line. Nothing new there, well except for the keyword “String” of course and the lack of square brackets. Nothing new, and nothing exciting just yet. Line 10 could also be written as Name = String("Bram"); , which will actually work as well, but now we assign the new object (holding the string “Bram”) to the old object, versus the method in the code where we assign just a string to the object. At least we already see that assigning new text to “String” is easier. Now let’s make that string longer, in the previous example, when using the array of char “string”, we noticed that we had to pay attention to the size of the array, so we wouldn’t go beyond it’s capacity. The “String” object however saves us that worry. It corrects automatically. You see? We can assign a much larger string than what we started out with, and when printing it, we experience zero problems. This is already a second point where the object is easier to use. So if the “String” object is so much easier to work with? Then why even bother with the “string” array of character? For two reasons. For one, the object will take up more memory, since it has all these fancy properties and methods. Another reason is that the String object, actually uses the “string” array of characters as well. Now the “String” object, has a lot of methods (functions) we can work with, which can make our life a lot easier when working with strings, and this is where we will really see the power of objects. Below an example of some of this trickery … for a full list of available functions, please take a good look at the Arduino String Object Reference. It will show you all the other tricks. In the example below we will concatenate strings, determine the length of the string and even add numbers to our string, without any real effort. Let’s walk through this example. We create the String object “Name” and assign it the value “Hans” (lines 7 and 8), which we can print with “Serial” as we have seen before. Now in line 12, we retrieve the length of our string – which is just the number of characters in the string, and not including the NULL terminating character. This is done with the “length()” method of the “String” object: Name.length() . This method will return a number, an integer, which we send right away to “Serial.print”. In line 14, we call the method “concat()” to concatenate ” has two nephews, called Bram and Max!” to the original string “Hans”. As you can see, this works right away. But … there is an easier way to glue an extra string to your “String” object by simply using the plus symbol (+), even the compound operator “+=” works. See lines 27 and 28, where we use “+=” and even the regular “+”. The “String” object however is even more powerful and can right away convert a number (int in this example) to a string, and replace or attach it to an existing string – see line 34 – which is something we cannot do with the previous “string” array of characters. Now if we know that String("some text") returns a “String” object, and we know that we can glue strings together with the plus symbol (+), and we know that “Serial.println()” take a “String” as a parameter,… then we can do some tricks to save us the hassle of writing 2 “Serial” lines (print() and println()) whenever we want to print values or variables. – Pass the resulting String object to the “Serial.println()” method (function). And the result will be exactly what we want, the Serial Monitor will print “Number seven = 7”. In line 3 we define an integer (int) variable called “test”. In line 4 we see an example similar to line 1, just in this case we are not using a value (7) but a variable (test), which works as well. Now in lines 6 and 7 we see something new, and this has nothing to do with strings or objects. Remember we said way back that we end a statement with a semicolon? In line 6 we did not do that, so the compiler assumes that the statement isn’t done yet and continues on the next line. The advantage is that breaking a statement like this over multiple lines actually makes your code more readable. Now try this example. Simply copy the code in the “setup()” function. See if you can do this on your own. Now printing and adding strings is all nice and dandy. But can we use strings to compare? Well, yes we can! The function “strcmp()” returns a zero when both strings are the same. This functions returns a number less than zero when the first string is smaller than the second string, or returns a number greater than zero when the first string is larger than the second string. When comparing the two strings, it will actually compare the ASCII values. So when it returns a number greater than zero, it actually means that it ran into a character which has a greater ASCII value compared to the other character, in the same position in the other string, and this can be confusing, because we humans would expect “Hans” to be greater than “Hi” – but its not. This is in part also because we humans see the longer string “Hans” as the larger one of the two. When comparing “Hans” and “Hi”, things go fine with the first character – they are the same. The second characters, “a” (ASCII: 97) and “i”(ASCII: 105), however, will cause an unexpected (human) response. “strcmp(“Hans”, “Hi”)” will result in a negative number … so “Hans” is smaller than “Hi”. So we see that “Hans” is smaller than “Hansie”, as we humans would expect. Unexpected, but “Hans” is also smaller than “Hi”, even though we humans expect the longer string to be the larger one. So if you’re looking for which string is longer, you’d better compare the length of both strings. This makes me follow the simple rule that “strcmp()” is best used to see if two strings are identical. In the example code you might have noticed an excellent example of the earlier mentioned “Escape character” in our strings,…. Comparing “String” objects result in the same kind of confusion, but instead of using the “strcmp()” function, we can use the simple comparison operators. I therefor commonly only use to see if two Strings are identical (==) or not equal (!=) to each other. If you have questions, just ask them below in the comment section, and keep in mind: There are no stupid questions! We all had to start at some point! There are 17 comments. You can read them below. I m totaly lost. In data type chapter string said as array of chatacters and char is only 1 character. Its chat data type. Shlndt it be string Name  = “Hans”; ?? A char is indeed one single character and a valid datatype. A string (the English word) indicates a bunch of characters, but is not a valid datatype. Create some space in memory that can hold 5 char’s, make “Name” point to the first char, and fill the space with the chars “H”, “a”, “n” and “s”. The end of the text (so after the “s”) in the allocated space is marked with a null character (which is also a “char”, we just can’t see it), so the 4 characters plus the null character fill up the allocated space of 5 chars. So that would be an array of 5 char’s. Now the data type “string” (small “s”) does not exist, and is not defined. Consider this like an alternative phrase or alias for saying “array of char”. The object String (capital “S”) however is a valid datatype and offers tools to work with the chars. For example, with a the 5 char array we just had, it would take a bit to put a 6 char text in. First we’d need to make the array larger, and then we can put the char’s in it. The object “String” however handles this automatically. Very convenient of course, but the downside is that it uses more memory that the array of char because it comes with a bunch of functions that do not come with that array of char. Also note that the array of char is the classic and more commonly used way to store text. You can either use “array of char” or “String”. For beginners “String” (with the capital “S”) would be the easiest. Once you want to save memory and optimize your code, then the “array of char” can be a better choice. Both can be used for text. String (capital S! ): Very easy to use, consumes more memory, but saves work when doing a lot with the text. Well okay i think we have a misspoint. I was talkimg about char and string. And you gave an example for char but you put not only 1 charactee into. You put 5 characters including Null. So its a 4 character Text (Hans). And i said its a Text so it must be a string datatype or function but u wrote code as ;char Name = “Hans.So that blow up my mind a lil. Hehe. Hahah, yes that’s why this topic can be a little confusing. Advertising revenue??? Hahahahhahahhaha oh my.. i need some hours to stop to laugh !! 😂😂You are Golden my friend. Hans , Is it possible to make a donate to your person ? you can always donate … and it is very much appreciated, but not required of course. Option 1 is shopping at Amazon, it won’t cost you anything, but if you’re not in the US then that might not be so beneficial (shipping costs etc). Alternatively you can donate through PayPal to hans @ luijten . net. well, if you don’t mind others reading our conversation, I’d recommend our forum: Arduino Forum – you’ll have to register but that’s free (if you haven’t already). Alternatively (and you need to be registered for that as well) you can go to the “User” menu and use “messages” there.